Chiney and Nnemkadi Ogwumike walk out of the locker room just before the second half. Nneka was talking emphatically to her younger sister….and Chiney had a big second half. It was an exciting game for the first half and some change. Both UCLA and Stanford were trying to out-defend each other, and it was working late into the period as the score hovered in the early 20’s. At the half, they were knotted at 28 points a piece. Perhaps the gap is closing with a program on the rise in Westwood, but Stanford is still more than any one player. And it’s still better than the rest of the conference by a margin greater than the skills of any individual, even one of the nation’s best players. Freshmen Chiney Ogwumike, Nnemkadi’s younger sister, and Toni Kokenis really want to be out there. Both established new career highs by playing 37 minutes against UCLA. Chiney led all players with 18 points and 15 rebounds, the latter a new personal best, while Kokenis finished with 13 points, 2 assists, 3 steals and invaluable backcourt minutes against UCLA’s tenacious trapping pressure defense. Nicely-put, and well-said by Tara VanDerveer. 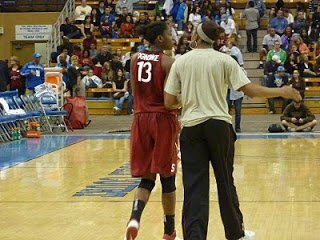 The longtime Stanford coach had beseeched Chiney at halftime to step it up, as her older sister sat out with an ankle injury from Friday night’s USC matchup. The stats are interesting. The two teams were dead even in assists and turnovers, and only one different in rebounds. The main difference was the shooting, as the Cardinal was 43.5 in the second half and 42 on the game, while the Bruins were a respective 28.1 and 31.1. One of the day’s highlights was the 6,725 that showed up at Pauley Pavilion. I haven’t seen that large of a crowd for a game in a long time. I think the gap between Stanford and the rest of the Pac-10 is indeed closing. But like the rebounding of the economy, it’s not happening fast enough. like i've said before, the bruins just don't have the size to hang with stanford for an entire game. the pure size and strength of the cardinal wears the opposing teams down. which leads me to…. what is going on with markel walker? whenever i see the bruins, she is basically m.i.a. patrick thinks a reason may be because she is trying to transition to a guard position. and my second question is, what's up with christina? she's a big body who should be in there banging. but i don't see her getting too many minutes (at least not when i catch the games). what are you thoughts on those two players, sass? That's part of what I mean about how there is a huge dropoff after the first four teams in the country and the rest. Size/conditioning is always a major factor. Depth and desire is too. Markel Walker appears to be in a sophomore slump after a great freshman year. Here's what I know: she was made a reserve (instead of a starter as she was last year) the first part of this season allegedly because of her poor attitude. When she first returned to the starting lineup she was fairly effective, but her productivity has fallen off. I have no idea why. Christina's best year under Nikki was last year. You'd think that in her senior year she'd be shining, but she seems to lack confidence out there on the floor. Again, not sure why. But maybe Nikki said it in the quote in the game story – how the players have to not be so complacent about big games. Complacency is the plague of the younger generation. you have a prime example on the bruins of someone who has a goal and it willing to do what it takes to get to it. of course, i'm referring to jasmine dixon. she wants to play in the wnba, knows her size is against her for a center position, so she's doing what it takes to position herself for a future. she saw her weight as a detriment for the transition and dropped some pounds. in turn, she's developed more foot speed. good for her! she's a monster on the boards, for being so under-sized. i give jas all the props for working toward her goal.she had to be dead-tired during the second half yesterday, but she never quit fighting! some of her teammates need to look to her for motivation on how to make yourself a better player. its not just talent, its mental and physical toughness. jas has all three. I can't disagree with any of that. She has been working hard since being able to play again after transferring, and her game has improved a lot. She is a threat both from the inside and outside now, and yes, I've been impressed time and time again by her strength. She's got a bright future ahead of her if she keeps this up.